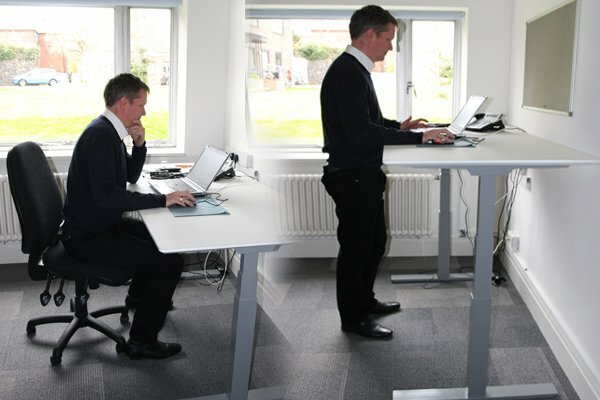 A sit, stand and move approach to working is, in our opinion and many others, the healthiest and most productive way for people who have desk based jobs, to work! Don’t take our word for it see for yourself, we’ve included links to lots of studies and research at the bottom of this post. The benefits of movement within the workplace are being highlighted on a regular basis, BBC news covered it last week! Sitting for long periods is bad for you, on so many levels! Standing for short periods throughout the day is better for your back and posture, and it’s easier to move and incorporate exercise from standing than ever it is from a sitting position. When standing you’re far more aware of your posture and it’s easier to make sure you’re breathing properly, using your whole diaphragm, when you’re not hunched over a desk. You may already stand while making important phone calls where you need to be completely focused and on top of your game, it’s amazing how much more authoritative you sound and feel when standing and talking. Do you need help to get moving? Our height-adjustable desk are the perfect solution. Book your free trial online or call us now on 01603 951595.